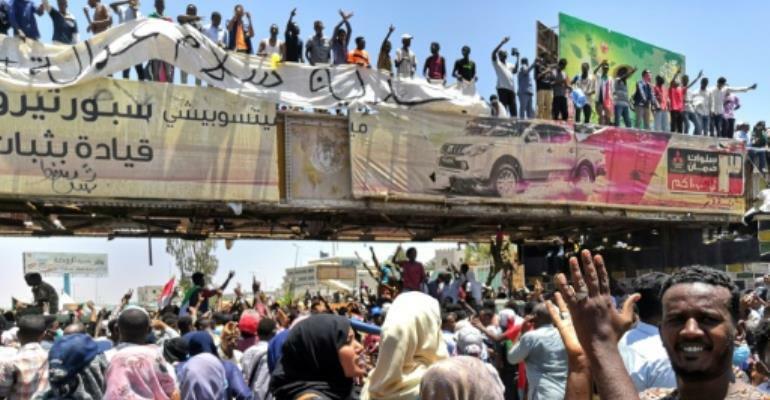 The United States, Britain and Norway said Tuesday that Sudanese authorities must now deliver a "credible plan for political transition" as anti-government protests rocked Khartoum. "The time has come for the Sudanese authorities to respond to these popular demands in a serious and credible way," the embassies of the three Western countries said in a joint statement in Khartoum. "The Sudanese authorities must now respond and deliver a credible plan for this political transition," it added as thousands of protesters massed outside the army headquarters in the capital demanding an end to President Omar al-Bashir's iron-fisted rule of three decades. The three countries also called on the authorities to release all political detainees and stop using violence against "peaceful protesters". The protests "continue to grow and the demand for political change from the courageous and resilient people of Sudan is becoming ever clearer and more powerful," the statement said. "The Sudanese people are demanding a transition to a political system that is inclusive and has greater legitimacy." The three countries vowed to support such a political process to help resolve the economic challenges facing the country. "This is a pivotal moment for the future of Sudan," the statement said. "The decisions the Sudanese authorities take now, in an inclusive dialogue, will have a dramatic impact on the lives of 40 million Sudanese people and the stability of the region." Sudan has been rocked by protests against Bashir's rule since December, with angry crowds demanding the veteran leader step down. They accuse his government of mismanaging the economy that has led to soaring food prices, and regular shortage of fuel and foreign currency.